Recently Grammarly asked its social media communities which writing mistakes were the worst kinds of errors. Our fans tend to find substantive grammatical trip-ups, like verb errors, far more frustrating than typographical errors and “stylistic” errors, such as homophone misspelling and preposition placement. Embed code for infographic at end of post. Here are the top five worst writing mistakes and how to avoid and correct them. I seen the movie last week. I saw the movie last week. I have (I’ve) been there! We was just about to start the reading. We were just about to start the reading. In many languages, it is important that the subject of the sentence aligns correctly with the verb conjugation in terms of number and gender. Since English does not conjugate verbs to reflect the gender of the subject, you only need to pay close attention to the number of the subject—is it a singular or plural noun? The struggles that the horse experiences while climbing the mountain is intense. Here the subject the struggles does not align with the verb “is.” Because struggles is plural, the verb should be are. The struggles that the horse experiences while climbing the mountain are intense. In English, irregular verbs and compound subjects make subject-verb agreement somewhat tricky. Irregular verbs, like those above, must be memorized, but compound subjects follow a simple rule—they are plural. See below for an example using the compound subject Jane and Mark. Jane and Mark are running a marathon this month. According to Grammarly’s research, run-on sentences are among the top grammar mistakes made by writers worldwide. A run-on sentence contains two or more independent clauses (a group of words that contains a subject and a verb and that can stand alone as a sentence) that are not connected with correct punctuation. Though there are different kinds of run-on sentence errors, most often writers neglect to use a comma before a coordinating conjunction (and, but, or, etc.). I enjoy writing immensely but my deadline is looming I am starting to feel overwhelmed. I enjoy writing immensely, but my deadline is looming; I am starting to feel overwhelmed. Each independent clause must be set apart from other independent clauses with punctuation or a comma and conjunction. Punctuation marks that are ideal for marking complete sentences are periods (full-stops), semicolons, and em dashes. Comma splices and run-on sentences go hand in hand. In fact, all comma splices are run-on sentences. He was very hungry, he ate a whole pizza. He was very hungry. He ate a whole pizza. He was very hungry, so he ate a whole pizza. To splice means to connect or join. When a writer joins two independent sentences with a comma instead of separating them with a period or a coordinating conjunction, that’s a comma splice. The comma has its own jobs to do, but connecting two independent sentences isn’t one of those jobs. Besides, the period gets testy when his sister, the comma, steals his thunder. Periods have their jobs, and so do commas, but never the twain shall meet—unless it’s in the form of a semicolon. Semicolons can also take the place of a coordinating conjunction, such as “and,” “but,” or “so,” among others. John had a card for Helga but couldn’t deliver it because he was in her way. John had a card for Helga but couldn’t deliver it because Tim was in Helga’s way. When you use the pronouns “her” or “him,” readers need to know to whom those pronouns refer. A pronoun without a clear antecedent is ambiguous. In our example sentence demonstrating an ambiguous pronoun, the reader is unsure who the second “he” is. Was John in the way, or was there another “he” involved? As noted in the corrected example, the pronoun “he” refers to Tim, who is card-blocking Helga. Always be sure your pronouns refer to a specific antecedent. Additionally, 5% of respondents said that the worst error was not listed in the poll. 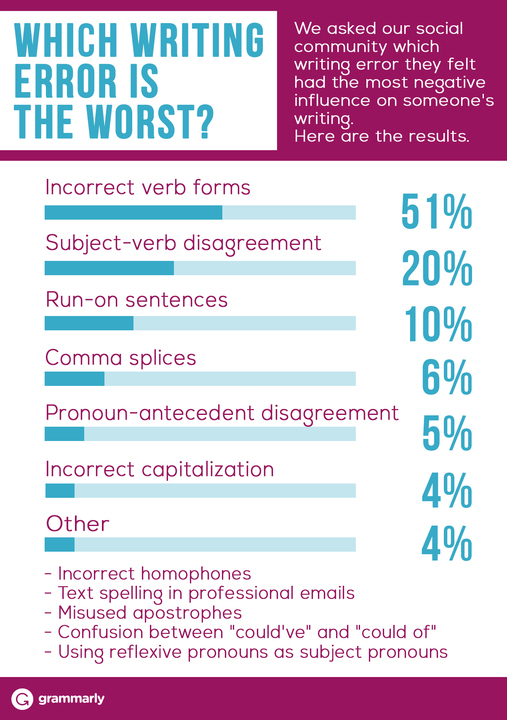 Participants listed homophone, apostrophe, and contraction spelling errors as the most frustrating, while others cited using textspeak in professional settings and plagiarism as the most egregious writing mistakes. What do you think? We love hearing from our community. Grammarly’s weekly polls are published every Wednesday and cover a range of subjects related to the state of writing, grammar, and education. You can find and participate in our most recent poll here. Share this infographic on your blog by copying and pasting the following embed code to your blog editor. 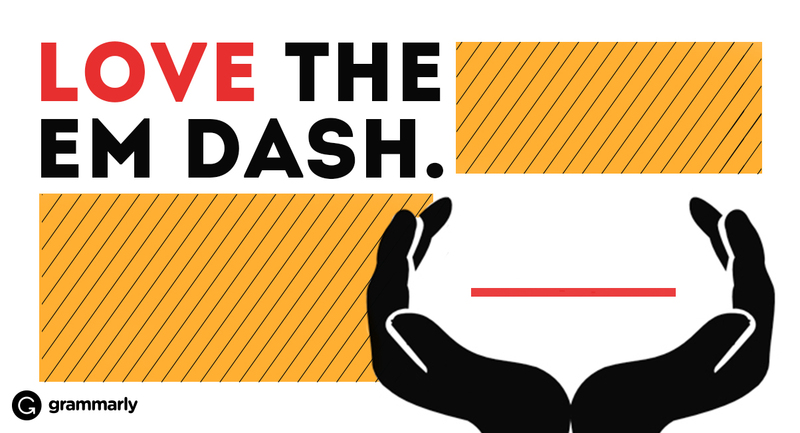 WritingHow to Set Boundaries With Your Boss Writing14 Clever Birthday Wishes to Impress Your Friends GrammarFirst, Second, and Third Person TrendsWorkplace Communication: It's Time to Write Better on Mobile GrammarEm Dash: Why Should You Love It? ResearchWe Studied 750 Top LinkedIn Profiles. Here’s How to Write Yours Better.